Coxiella burnetii is the etiological agent of Q fever found worldwide. The microorganism has like other Gram-negative bacteria a lipopolysaccharide (LPS, endotoxin) in its outer membrane, which is important for the pathogenicity of the bacteria. In order to understand the biological activity of LPS, a detailed physico-chemical analysis of LPS is of utmost importace. The lipid A moiety of LPS is tetraacylated and has longer (C-16) acyl chains than most other lipid A from enterobacterial strains. The two ester-linked 3-OH fatty acids found in the latter are lacking. 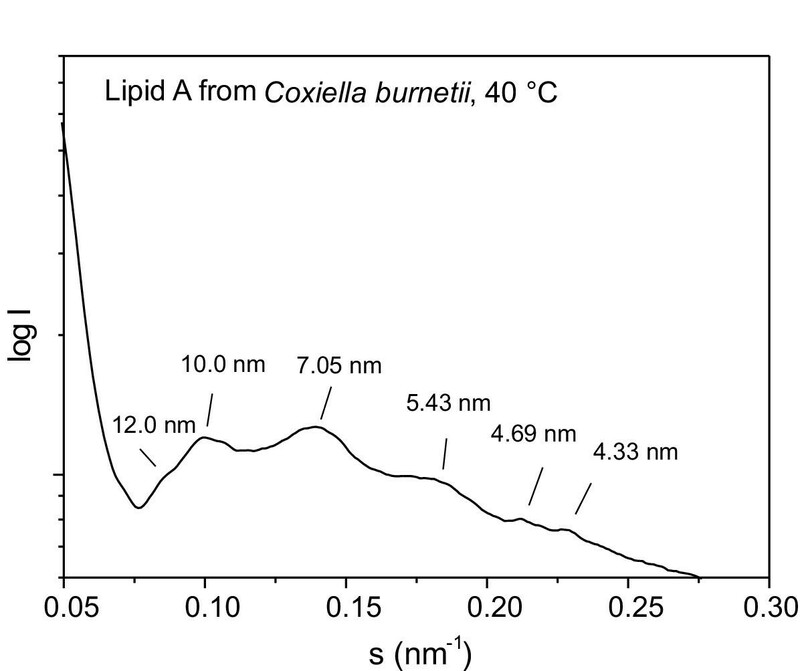 The acyl chains of the C. burnetii endotoxins exhibit a broad melting range between 5 and 25°C for LPS and 10 and 40°C for lipid A. The lipid A moiety has a cubic inverted aggregate structure, and the inclination angle of the D-glucosamine disaccharide backbone plane of the lipid A part with respect to the membrane normal is around 40°. Furthermore, the endotoxins readily intercalate into phospholipid liposomes mediated by the lipopolysaccharide-binding protein (LBP). The endotoxin-induced tumor necrosis factor α (TNFα) production in human mononuclear cells is one order of magnitude lower than that found for endotoxins from enterobacterial strains, whereas the same activity as in the latter compounds is found in the clotting reaction of the Limulus amebocyte lysate assay. 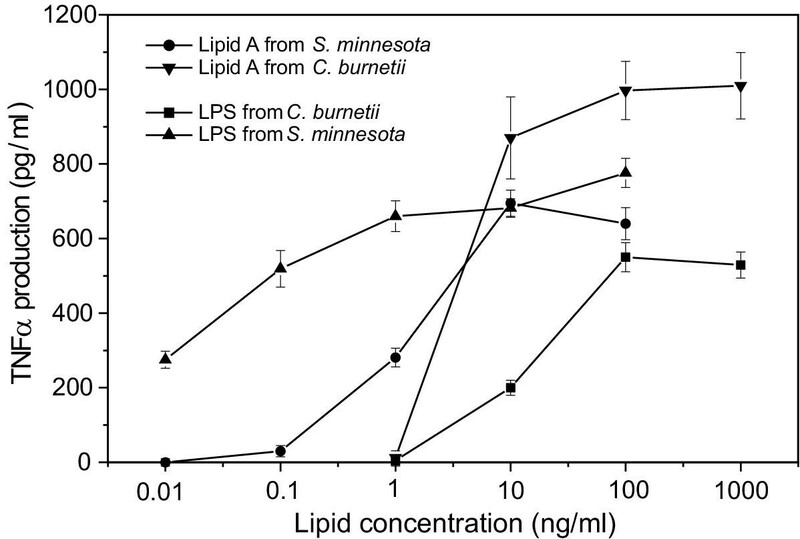 Despite a considerably different chemical primary structure of the C. burnetii lipid A in comparison with enterobacterial lipid A, the data can be well understood by applying the previously presented conformational concept of endotoxicity, a conical shape of the lipid A moiety of LPS and a sufficiently high inclination of the sugar backbone plane with respect to the membrane plane. Importantly, the role of the acyl chain fluidity in modulating endotoxicity now becomes more evident. Coxiella burnetii is the etiological agent of Q fever, which belongs to the most frequent diseases of rickettsial origin in the world. The most common, acute form of Q fever is characterized as a flue-like illness or atypical pneumonia, or less frequently as granulomatous hepatitis, with a significant incidence of neurologic complications . Persistent infections in humans can lead to a chronic form of Q fever, which may be associated with an often fatal endocarditis . One of the main components of C. burnetii outer membrane is lipopolysaccharide (LPS), which plays an important role in the interaction of the microbe with the host and determines its pathogenicity and its immunogenicity [3–6]. Several papers [7–12] were devoted to the chemical characterization of the carbohydrate region of C. burnetii LPS. Two branched sugars virenose (6-deoxy-3-C-methyl-D-gulose) and dihydrohydroxystreptose [3-C-(hydroxymethyl)-L-lyxose], were detected mainly in terminal positions in the O-polysaccharide chain of the LPS in considerable amounts [13–15]. As these sugars have not been found in other LPS, they are important chemotaxonomic markers. We have recently shown that they might be involved in the immunobiology of Q fever  and presented preliminary data on the lipid A moiety of the C. burnetii LPS strains Henzerling and S . The possible role of the LPS in the immunobiology of C. burnetii remains amatter of debate. 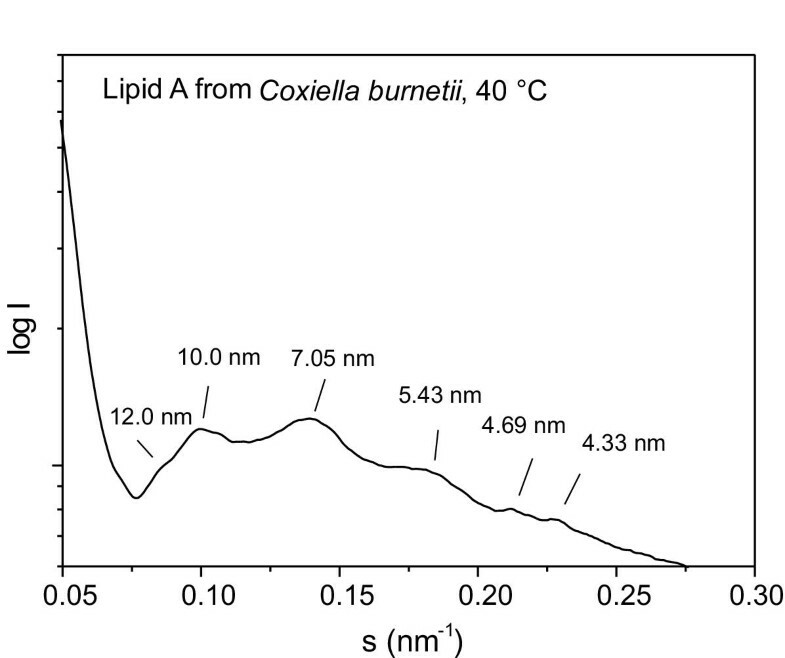 In order to cast more light on this problem, we report the results of investigations on the physico-chemical behaviour of the C. burnetii LPS and lipid A in relation to their bioactivity, based on the established correlation between the biological activity of endotoxins and particular physico-chemical parameters [18, 19]. The results are reported herein. Lipid A released from the parent LPS strain Priscilla on treatment with sodium acetate buffer containing SDS was shown to contain GlcN and phosphate in the molar ratio of 1:0.90. GC analysis revealed that GlcN had the D configuration. No other sugars or pyrophosphate were detected. Fatty acids were analyzed by GC and GC-MS after mild and strong methanolyses of the lipid A followed by trimethylsilylation. Analyses revealed the presence of five different linear or branched nonhydroxy fatty acids and of eight (R)-configured 3-hydroxy fatty acids (Table 1). Fatty acids amounting less than 2 mol% were not considered. The major nonhydroxy fatty acids were normal hexadecanoic and 12-methyltetradecanoic acids (nC16:0 and aC15:0). The most prominent 3-hydroxy fatty acids were (R)-3-hydroxy-14-methylpentadecanoic and (R)-3-hydroxyhexadecanoic acids (3-OH-iC16:0 and 3-OH-nC16:0). GC-MS data of the analyzed samples indicated that nonhydroxy fatty acids were ester-linked and hydroxylated fatty acids were amide-linked. No fatty acids were detected under conditions used for the liberation of 3-acyloxyacyl groups . n, normal fatty acids; i, a, iso, anteiso-branched fatty acids. The negative-ion MALDI mass spectrum of diphosphoryl lipid A gave a cluster of four ions with two main molecular ion signals at m/z 1485.12 [M1 - H]- and 1471.53 [M2 - H]-. Compositions of the corresponding molecular species were established on the basis of the overall chemical composition: m/z 1485.12 corresponds to two GlcNs (2 × 161.2 u), two phosphates (2 × 80 u), two C16:0 (2 × 238.5 u), and two 3-OH-C16:0 (2 × 254.5 u). The molecular species at m/z 1471.53 differed from M1 by a mass difference of -14 (CH2). From the fatty acid composition given in Table 1 it can be judged that one C16:0 was substituted by a C15:0. Other cluster signals represented mass differences ± 14 (CH2), which indicated a considerable microheterogeneity of the lipid A moiety with regard to the substitution by fatty acids of different lengths. The MALDI MS data were in agreement with the negative-ion plasma desorption mass spectrum of the same lipid A sample, which also exhibited two main molecular ion signals at m/z 1485 and 1471 (Caroff, M., Toman, R., unpublished results). In the lower mass range, there was a group of three peaks at m/z 732.31, 748.26, and 777.48. From the known fragmentation  in the negative ion-mode, the first two represent Z1 and Y1 fragments comprising the GlcN I moiety consisting of one GlcN, one phosphate, one C16:0, and one 3-OH-C16:0 without and with the oxygen atom joining it to GlcN II (Fig. 1). The peak at m/z 777.48 can be assigned to the GlcN I moiety (733 u) plus OHCO (45 u) from the GlcN II ring by a double cleavage of C5'-O and C1' -C2' (fragment X1). In the positive-ion mode, MALDI MS gave one cluster of ions centered around that with m/z 735.08. 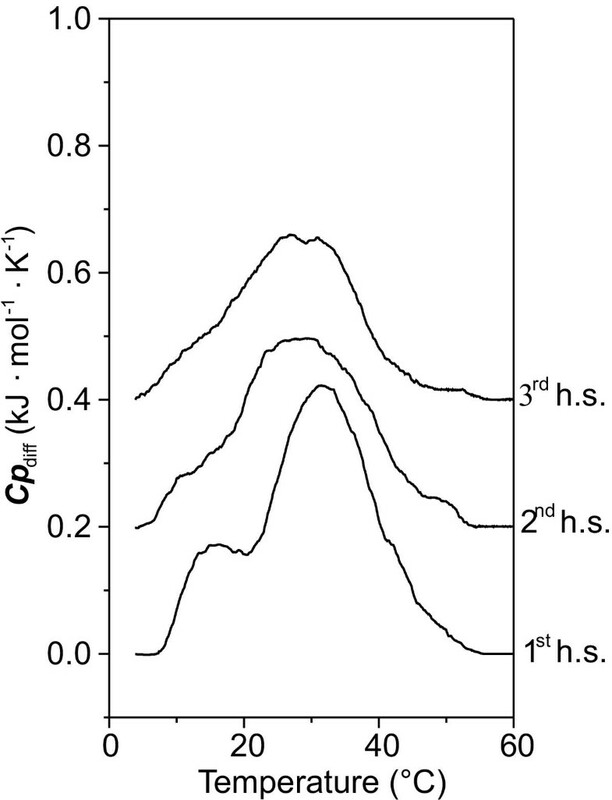 This peak and the other one at m/z 721.15 were interpreted to correspond to the B1 ions  containing one GlcN, one phosphate, one C16:0, one 3-OH-C16:0 and one GlcN, one phosphate, one C15:0, and one 3-OH-C16:0, respectively (Fig. 1). From this fragmentation pattern, we concluded that the signals correspond to the GlcN II part of the lipid A molecule and that C16:0 and C15:0 may alternate at the C-3' position. 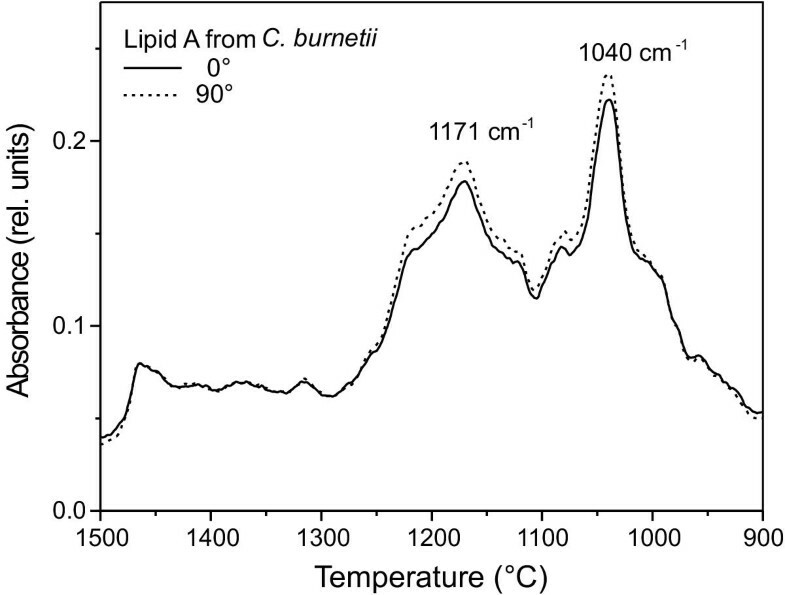 The gel (β)-to-liquid crystalline (α) phase transition behaviour of the hydrocarbon chains of the C. burnetii LPS and lipid A was monitored by evaluation the peak position of the symmetric stretching vibrational band of the methylene groups via FTIR spectroscopy. The phase transition temperatures Tc of the samples are low as shown in Fig. 2. In the gel phase, the peak position of νs(CH2) of amphiphilic compounds is usually located between 2850.0 and 2850.5 cm-1 and in the liquid crystalline phase between 2852.5 and 2853.0 cm-1 . This means that the transition range for the lipid A is in the temperature interval between 10 and 40–50°C, and that for the LPS in the range between – 10°C and 20°C. 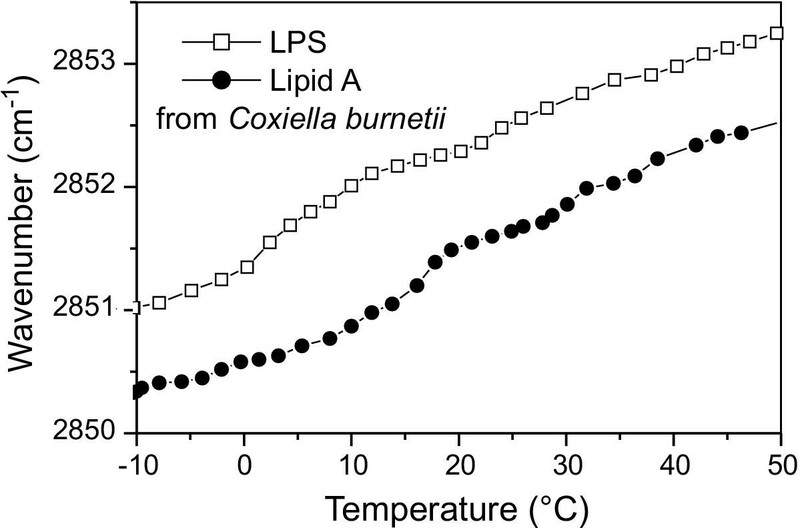 Note that both samples are in the liquid crystalline phase at 37°C with the LPS being significantly more fluid than lipid A. The phase transition behaviour of lipid A was also monitored with differential scanning calorimetry (Fig. 3). In accordance with the IR measurements, a very broad transition takes place between 10 and 50°C. Two maxima at 16 and 32°C are observed in the heat capacity curve of the overall broad phase transition. These two phase transitions are also observed in the infrared experiment (Fig. 2). The phase transition enthalpies (Δ H = 6 - 9 kJ/mole), which slightly decrease upon further cycling, are considerably lower than those found for enterobacterial lipid A (20 to 30 kJ/mol ). Heat capacity curves (1st to 3rd heating-scan, h.s.) of lipid A from C. burnetii strain Priscilla from differential scanning calorimetry. The phase transition enthalpies can be calculated from the areas of the transition and are 9, 7, and 6 kJ/mole for the respective scans. The angle between the diglucosamine ring plane and the membrane plane was determined by dichroic measurements using polarized IR light with oriented multilayers of the endotoxins. For this, the 0 and 90° infrared ATR spectra were measured (Fig. 4) and the dichroic ratios R of the vibrational bands around 1171 cm-1 and 1040 cm-1 (mean value of both bands) were calculated. Clearly, the two bands exhibit 90° polarization. The order parameter S was estimated from the peak position of νs(CH2). The values of the angle θ between the diglucosamine ring plane and the membrane plane (perpendicular to the direction of the acyl chains) calculated as described previously  are listed for lipid A and LPS in table 2. 0° and 90° polarized infrared spectra of lipid A from C. burnetii strain Priscilla in the wavenumber range 1500 to 900 cm-1. The vibrational bands at 1171 and 1040 cm-1 correspond to diglucosamine ring vibrations. Dichroic ratios R, order parameter S, and inclination angle between membrane plans and diglucosamine ring plane. The R-values were obtained from measurements such as shown in Fig. 4. The data clearly indicate that in both samples the sugar ring plane is significantly inclined with respect to the membrane plane. This inclination is, however, lower than that found for enterobacterial lipid A, for which values around 50° and higher are found, but is comparable to enterobacterial monophosphoryl (4'-phosphate) lipid A (around 35–40°) . The determination of the aggregate structure of lipid A from C. burnetii was determined by synchrotron radiation X-ray diffraction. The X-ray pattern shown in Fig. 5 indicates the existence of a complex nonlamellar structure. However, since the relations 7.05 nm = 10.0 nm/√2, and also 7.05 nm = 12.0 nm /√3, as well as 5.43 nm = 12.0 nm/ √5, and 4.33 nm = 12.0 nm / √8 hold true, at least one major substructure should have cubic symmetry. The intercalation of endotoxins into target cell membranes, meditated by lipopolysaccharide-binding protein (LBP), is an important step in cell activation [24, 25]. 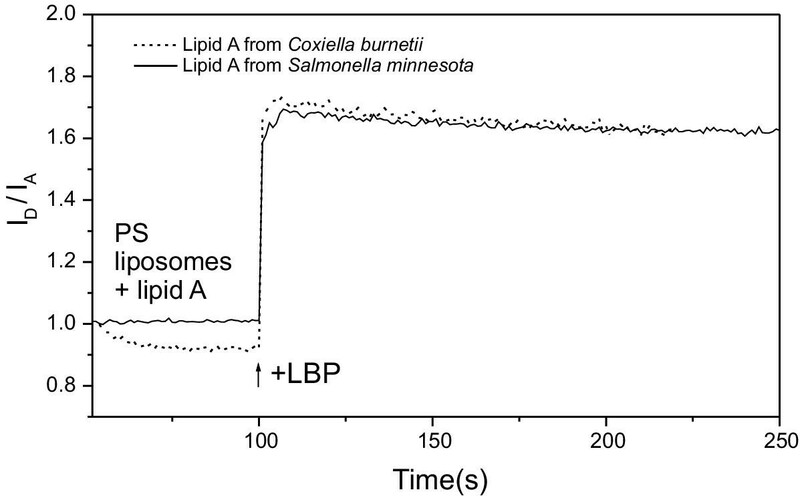 The LBP-mediated intercalation of lipid A from C. burnetii into phospholipid liposomes was compared to that from Salmonella minnesota by using FRET. As illustrated in Fig. 6, addition of LBP to the liposomes in the presence of the corresponding lipid A results in a strong increase in the fluorescence signal indicating an intercalation of the two different lipid A compounds. LBP-mediated intercalation of lipid A from C. burnetii strain Priscilla and S. minnesota strain R595 into phosphatidylserine liposomes from the ratio of the donor fluorescence intensity ID to that of the acceptor IA. At 50 s, lipid A was added to the liposomes, and after 100 s, LBP was added. The cytokine-inducing capacity of both C. burnetii LPS and lipid A was tested and compared to that of LPS and lipid A from Salmonella minnesota strain Re 595 by stimulating human mononuclear cells (MNC). A representative result is shown in Fig. 7 indicating the highest activity for the Re LPS and one to two order of magnitude lower activity for its lipid A. In contrast, the C. burnetii endotoxins exhibit significantly lower activity that disappears already at the endotoxin concentration of 1 ng/ml. Interestingly, in sharp contrast to the behaviour of the Salmonella endotoxins, for the Coxiella endotoxins lipid A exhibits stronger activity than the parent LPS. Production of tumor-necrosis-factor α (TNFα) of human mononuclear cells induced by different concentrations of LPS and lipid A from Salmonella minnesota strain R595 and C. burnetii strain Priscilla. The data result from one representative experiment. The mean and standard deviation are based on the data from the determination of TNFα in duplicate at two different dilutions. A repetition of the experiments yielded the same dependences except for the absolute amount of TNFα-production which may vary significantly between different donors. Further, the ability to induce the coagulation cascade in the LAL test was examined. A high activity down to a concentration of 10 pg/ml, independently on the origin of the endotoxins used, was found (data not shown). Thus, in contrast to the cytokine induction there is no significant difference in the induction of coagulation between the LPS and lipid A used in this study. The remarkable differences in both chemical composition and structure of the endotoxins thus apparently do not play a role in this test system. In the first step of these studies we established basic structural features of the lipid A from C. burnetii strain Priscilla. The chemical investigations revealed that despite a considerable microheterogeneity the two major molecular species depicted in Fig. 1 are the major components. They share the classical backbone of diphosphorylated D-GlcN disaccharide, in which both GlcN I and GlcN II carry amide-linked 3-OH-iC16:0 or 3-OH-nC16:0. One of the species has ester-linked nC16:0 at both GlcNs while the other one has ester-linked aC15:0 instead of nC16:0 in GlcN II. Other less abundant molecular species are closely related to them and differ one from another only by mass difference of ± 14 (CH2) depending on the fatty acid bound. In a previous paper , reporting on the fatty acid compositions of the LPS isolated from C. burnetii strain Nine Mile in virulent phase I and low virulent phase II, the authors have identified more than 50 different 3-acyloxyacyl residues to be involved in amide linkages. This together with the other fatty acids found suggested an enormous heterogeneity of the lipid A component in both LPS. In contrast, our results have shown that both composition and structure of the major molecular species of the investigated lipid A are quite simple as illustrated in Fig. 1. In our preliminary studies, similar structural features have been found for lipid A of the LPS from C. burnetii strains Henzerling and S , and most recently, for lipid A from the abovementioned strain Nine Mile in virulent phase I and low virulent phase II . The data indicate that lipid A in various C. burnetii strains may represent a highly conserved region of their LPS. Thus, the chemical structure of the C. burnetii lipid A differs considerably from those of typical enterobacterial lipid A with high endotoxicity . Distinct structural features of the lipid A could be the cause for its reduced endotoxic potency reported in this work and elsewhere [3, 8], leading to unique physico-chemical properties (see below) in comparison with the enterobacterial lipid A. We have found previously that a prerequisite for the cytokine-inducing activity of a lipid A-like compound is the existence of a non-lamellar cubic aggregate structure of the lipid A moiety of LPS, which corresponds to a strictly conical shape of the single molecules . Furthermore, a high inclination angle of more than 45° was observed for all biologically highly active compounds, whereas samples with medium inclination angle and moderate conical shape such as monophosphoryl lipid A were much less active . Compounds with low or no inclination and with cylindrical shape such as pentaacyl and tetraacyl lipid A from Escherichia coli mutants were more or less inactive, but could act antagonistically against the action of LPS. The endotoxins of C. burnetii fulfill the main criterion of endotoxicity, the cubic aggregate structure (Fig. 5). However, the inclination angle is much less than that found for enterobacterial hexaacylated samples (Table 2), and would correspond in the light of our concept to lipid A with significantly reduced activity. This is impressively confirmed by the results of the TNFα-inducing capacity in mononuclear cells (Fig. 7). In this context, it has to be noted that agonistically inactive tetraacylated lipid A (synthetic '406') with C14 chains has a much lower inclination angle, 10 to 20° . The reason for this discrepancy is unclear. It has to be considered, however, that the DSC data indicate drastic differences of the enthalpy change Δ Hc for lipid A from Coxiella (6–9 kJ/mole) as compared to hexaacyl lipid A from enterobacterial strains (20 to 30 kJ/mole ). On the basis of the number of CH2 groups, the Δ Hc for the two lipid A should be approximately the same under the prerequisite of identical packing density. This means that the packing density of the Coxiella lipid A must be considerably smaller. Furthermore, DSC as well as FTIR data (Figs. 2,3) are indicative of two phase transitions which could correspond to two subspecies. The various non-stoichiometric substituents may be responsible for these observations, which subsequently may lead to the observed inclination. We have reported earlier [29, 30] that the lipid A acyl chain fluidity is not a basic determinant of endotoxic activity, but may modulate it. Thus, when a lipid A and various LPS chemotypes with different lengths of sugar residues and of the same enterobacterial origin are compared, the highest activity is found for an Re LPS with a Tc lying around 30°C corresponding to the highest acyl chain mobility at 37°C. For other rough mutant LPS Rd to Ra, the bioactivity slightly decreases, which seems to be correlated with an increase of Tc up to 36°C corresponding to a decrease of the acyl chain mobility at 37°C . The largest decrease of bioactivity is found for lipid A, which can be correlated with a drastic increase of Tc up to 45°C, corresponding to gel-like hydrocarbon chains at 37°C. Thus, the remarkable differences in bioactivity of one to two orders of magnitude, observed for enterobacterial lipid A and LPS (Fig. 7), could be due to the high difference in the acyl chain mobility at 37°C. For the C. burnetii endotoxins, these considerations do not hold true. It can be concluded from the data of the phase transition measurements (Fig. 2,3) that both compounds are in the liquid crystalline phase at 37°C, although the acyl chains of LPS are still more mobile than that of lipid A. However, the DSC data show (Fig. 3) that most of the lipid A acyl chains are molten at 37°C. Thus, these data have verified experimentally for the first time our assumption that the acyl chain mobility is responsible for the large differences in biological activity between the enterobacterial LPS and lipid A. As shown in Fig. 7, the C. burnetii lipid A seems to be even more active than the parent LPS. These data confirm the fact that lipid A is the 'endotoxic principle' of LPS, and indicate that it is possible to discriminate between the effect of molecular conformation (shape) and acyl chain mobility. In the Limulus test, identical activation by Coxiella and Samonella LPS and lipid A were found. For an understanding, the structural requirements of the activation of the clotting cascade must be considered. By using different synthetic lipid A and part structures, Takada et al  have shown that the monophosphoryl 4'-phosphate lipid A has the same activity as bisphosphoryl lipid A, whereas the monophosphoryl 1-phosphate lipid A has strongly reduced activity. We have found that the interaction of LPS and lipid A with hemoglobin  or albumin  led to a strong or slight increase, respectively, of the cytokine production in mononuclear cells, but was not correlated with the results in the Limulus test, which exhibited somehow non-systematic variations. The binding of high-density lipoprotein (HDL) to the enotoxins, however, led to a clear, concentration-dependent decrease of the immunostimulatory activity in the human system as well as the Limulus activity . Additionally it was found that the binding epitope of HDL within the lipid A backbone is essentially the diglucosamine headgroup inclusive the 4'-phosphate . From these data the results presented here become intelligible, the 4'-phosphate diglucosamine backbone is the same for Coxiella and Salmonella lipid A, and therefore identical reactivities are observed. From these data it becomes also clear that the Limulus test is not a measure of toxicity of endotoxin preparations. Although a complete interpretation of a correlation between physico-chemical parameters and bioactivity is presently not possible, there is a wealth of experimental evidence that the molecular conformation of the lipid A moiety of an LPS plays a role after intercalation into target cell membranes such as those of mononuclear cells. It has been shown previously that the intercalation is mediated by LBP (see Fig. 6) [24, 25], but one may assume that also mCD14 is able to intercalate LPS after binding. In the membrane, an LPS with conically-shaped lipid A is able to induce sterical stress at the site of signalling proteins such as the Toll-like receptor 4  or the K+-channel MaxiK  leading to transmembrane signalling. The influence of the acyl chain mobility may be displayed in the way that the binding of LPS having more fluid acyl chains to proteins such as LBP and/or CD14 is enhanced, and in particular that the intercalation into the target cell membranes is facilitated. C. burnetii strain Priscilla (PR) was from the strain collection of the WHO Collaborating Centre for Rickettsial Reference and Research at the Institute of Virology, Slovak Academy of Sciences, Bratislava, Slovak Republic. PR was propagated in embryonated hen eggs. After cultivation, the PR cells were purified by centrifugation and extraction with ether as described earlier . The PR cells were treated first with RNAse (EC 3.1.27.5) and DNAse I (EC 3.1.21.1), both from bovine pancreas (Roche, Mannheim, Germany), then with trypsin (EC 3.4.21.4, from bovine pancreas, Serva, Germany), and finally with proteinase K (EC 3.4.21.14, from Tritirachium album, Sigma, USA). The cells were extracted further with chloroform-methanol (2:1, v/v) at 20°C for 4 h to remove phospholipids. The extraction was repeated with the fresh solvent mixture for 2 h. The crude LPS was isolated from the cells by the hot phenol/water method as described  and purified further by ultracentrifugation (120,000·g) at 5°C for 4 h until sodium dodecyl sulphate-polyacrylamide gel electrophoresis (SDS-PAGE), TLC, and UV spectroscopy showed no detectable contaminants. Lipid A was prepared from the LPS by hydrolysis with 20 mM sodium acetate/acetic acid buffer (pH 4.5) containing 1% of SDS at 100°C for 1 h . A sample of lipid A was hydrolyzed with 4 M HCl at 100°C for 4 h.
Lipid A samples were usually prepared as aqueous dispersions at high buffer content, i.e., above 80 % using 20 mM HEPES (pH 7). For this, the lipids were suspended directly in buffer, sonicated and temperature-cycled several times between 5 and 70°C and then stored at 4°C for at least 12 h before measurement. SDS-PAGE was performed in slabs containing 12.5% of polyacrylamide and the gels were silver-stained for LPS as described . TLC was accomplished on precoated Silica Gel 60 plates (Merck, Germany) with (v/v) 30/15/4.5/0.5 n-propanol-water-chloroform-1 M ammonium hydroxide and 4.5/3.5 isobutyric acid-1 M ammonium hydroxide solvent mixtures. Spots were visualized by charring after spraying with 10% sulphuric acid in ethanol. 3-deoxy-D-manno-2-octulosonic acid (Kdo), protein, phosphate, and hexosamine contents were determined as reported . 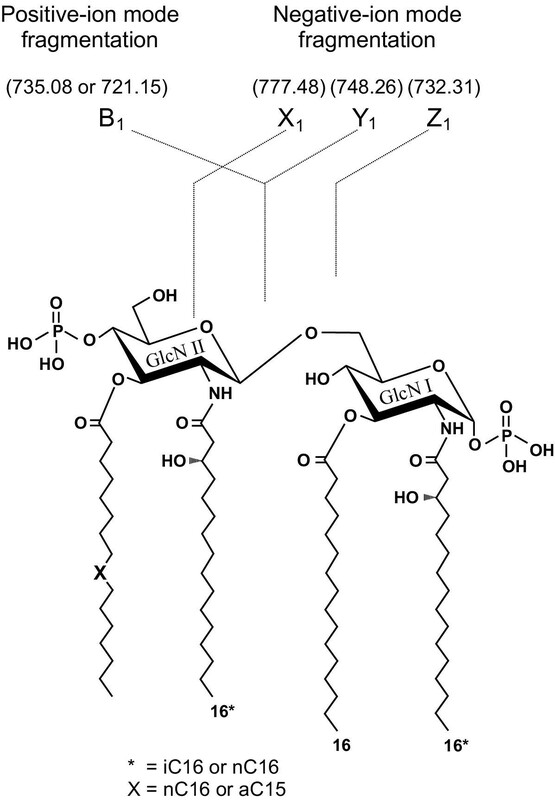 Estimation of the absolute configuration of glucosamine (GlcN) in lipids A was established as given elsewhere [39, 40]. Total fatty acids were analyzed by gas chromatography (GC) and GC-mass spectrometry (GC-MS) after hydrolysis of lipid A with 4 M HCl in dry MeOH at 100°C for 16 h and trimethylsilylation. Ester-linked fatty acids were determined after their release with 2 M HCl in MeOH at 60°C for 2 h. The stereochemistry of 3-hydroxy fatty acids was established as described . GC was performed with a Shimadzu model 17A chromatograph equipped with flame-ionization detector using helium as the carrier gas. Alditol acetates of amino sugars were analyzed on an HP-5 column (25 m × 0.32 mm, Hewlett-Packard, USA) at 160 (3 min) increasing to 245°C at 3°C.min-1. Fatty acids were separated on a DB-1 column (60 m × 0.25 mm, Fison, UK) at 180 (2 min) increasing to 280°C at 4°C.min-1 with a final 30 min hold. GC-MS was performed with a Shimadzu GCMS-QP5000 mass spectrometer with helium as the carrier gas. Electron impact mass spectra were recorded at 70 eV and an interface temperature of 300°C. GC-MS was run with the columns and temperature programs already described. Matrix-assisted laser desorption/ionization-time-of-flight mass spectrometry (MALDI-TOF-MS) of lipid A was performed with a KOMPACT MALDI IV (Kratos Analytical, Japan) in the linear TOF configuration at an acceleration voltage of 20 kV. 2,4,6-Trihydroxyacetophenone (Aldrich, Taufkirchen, Gemany) was used as the matrix. Analyte ions were desorbed from the matrix with pulses from a 326 nm nitrogen laser. Each spectrum represents an average of 60 pulses. Lipid A samples in the amount of 0.25–0.5 μg were used. The infrared spectroscopic measurements were performed on a IFS-55 spectrometer (Bruker, Karlsruhe, Germany). The lipid samples were placed in a CaF2 cuvette with a 12.5 μm teflon spacer. Temperature-scans were performed automatically between 10 and 70°C with a heating-rate of 0.6°C.min-1. Every 3°C, 50 interferograms were accumulated, apodized, Fourier transformed, and converted to absorbance spectra. For strong absorption bands, the band parameters (peak position, band width, and intensity) were evaluated from the original spectra, if necessary after subtraction of the strong water bands. The lipids were prepared as oriented thin multilayers as described previously  by spreading a 1 mM lipid suspension – which was temperature-cycled between 5 and 70°C several times prior to spreading – in Hepes buffer on a ZnSe ATR crystal and evaporating the excess water by slow periodic movement under a nitrogen stream at room temperature. The lipid sample was placed in a closed cuvette, and the air above the sample was saturated with water vapour to maintain full hydration. Infrared ATR polarized spectra at 0 and 90° were recorded using a mercury-cadmium-telluride (MCT) detector with a scan number of 1000 at a resolution of 2 cm-1. The measurements were performed at 28°C, the intrinsic instrument temperature. Dichroic ratios R for particular vibrational bands from the diglucosamine backbone were evaluated at 1170 and 1045 cm-1. The angle θ represents the angle between the diglucosamine diphosphorylated backbone and the direction of the hydrocarbon chains, and can be calculated from the measured R, if an approximate value of the order parameter S is known. As a first approximation, the S-value calculated according to the relationship between S, θ, and R, based on the peak position xs of the symmetric stretching vibration νs(CH2) can be used, where S is calculated according to S = -941.8 + 0.7217·xs -7.823·10-5 ·xs 2 – 2.068·10-8 ·xs 3. It should be noted that S defined in this way should be similar, but not identical to the order parameter used in NMR spectroscopy (S = 1 for perfectly aligned and 0 for isotropic acyl chains). Since the hydrocarbon chains of the lipid multilayer are distributed homogenously around the normal to the ATR plate ('partial axial distribution'), a tilt of the backbone with respect to the direction of the acyl chains leads to a broader orientational distribution of the backbone, which would correspond to a lower S-value. This implies that the acyl chains are more isotropically distributed and that the estimate of S is an upper limit. The water content of the samples on the ATR crystal, which is important for an exact calculation of the z-component of the electric field, Ez, was estimated from the ratio between the peak intensities of the main OH-stretch around 3400 cm-1 and the antisymmetric stretch of the methylene groups around 2920 cm-1. Since this ratio depends on the chemical composition of the particular lipid/protein sample at a given water content, each sample was calibrated by recording IR spectra in transmission at various water contents and determining the corresponding peak ratios. Differential scanning calorimetry (DSC) measurements were performed with a MicroCal VP scanning calorimeter (MicroCal, Inc., Northhampton, MA, USA). The heating and cooling rate was 1°C/min. Heating and cooling curves were measured in the temperature interval from 10 to 100°C. The phase transition enthalpy is obtained by integration of the heat capacity curve as described previously . Usually, three consecutive heating and cooling scans were measured. The lipid dispersion is prepared according to recently described protocols at a concentration of approximately 1 mg/ml in phosphate buffer at pH 6.8 . (hkl = Miller indices of the corresponding set of plane). The FRET assay was performed as described earlier [24, 25]. Briefly, phospholipid liposomes from phosphatidylserine (PS) or from a phospholipid mixture corresponding to the composition of the macrophage membrane  were doubly labelled with the fluorescent dyes N-(7-nitrobenz-2-oxa-1,3-diazol-4yl)-phosphatidylethanolamine (NBD-PE) and N-(lissamine rhodamine B sulfonyl)-phosphatidylethanolamine (Rh-PE) (Molecular Probes, Eugene, OR, USA). Intercalation of unlabeled molecules into the doubly labelled liposomes leads to probe dilution and with that to a lower FRET efficiency: the emission intensity of the donor increases and that of the acceptor decreases. In all experiments, doubly labelled phospholipid liposomes were prepared and after 50 and 100 s, respectively, lipid A and LBP were added subsequently, each at a final concentration of 0.01 mM, and the NBD donor fluorescence intensity ID at 531 nm and acceptor intensity IA at 593 nm were monitored for at least 300 s. As sensitive signal of a membrane intercalation, the ratio ID/ ID was plotted versus time. For examination of the cytokine-inducing capacity of the LPS and its lipid A, human mononuclear cells (MNC) were stimulated with the latter compound and the TNFα production of the cells was determined in the supernatant. MNC were isolated from heparinized (20 IE·mL-1) blood taken from healthy donors and processed directly by mixing with an equal volume of Hank's balanced solution and centrifugation on a Ficoll density gradient for 40 min (21°C, 500 g). The layer of HMNC was collected and washed twice in Hank's medium and once in RPMI 1640 containing 4% human serum, 2 mM L-glutamine, 100 U·mL-1 penicillin, and 100 μg·mL-1 streptomycin. The cells were resuspended in medium and their number was equilibrated at 5 ≅ 106 cells.mL-1. For stimulation, 200 μL/well MNC (5 ≅ 106 cells·mL-1) were transferred into 96-well culture plates. The stimuli were serially diluted in medium and added to the cultures at 20 μL per well. The cultures were incubated for 4 h at 37°C under 5 % CO2. Supernatants were collected after centrifugation of the culture plates for 10 min at 400 g and stored at -20°C until determination of the cytokine content. Determination of TNFα in the cell supernatant was performed in a sandwich-ELISA as described elsewhere . Briefly, 96-well microtiter plates (Greiner, Solingen, Germany) were coated overnight at room temperature with a monoclonal (mouse) anti-human TNFα antibody (clone 16 from Intex AG, Switzerland) followed by three washings with water. One hundred microliter samples of culture supernatants were dispensed into the wells and incubated with HRP-conjugated rabbit anti-human TNFα antibody (Intex) for 16–24 h at 4°C. After washing, the color reaction was started by addition of tetramethylbenzidine/H202 and stopped by the addition of 1 M sulfuric acid. Serial dilutions of human recombinant TNFα (Intex) provided a standard curve. Plates were read at 450 nm with an ELISA photometer. Quantification of TNFα was determined with detection ranges of 0–500 pg/ml. TNFα content was determined for each condition and the data given are average values ± SD from the TNFα determination in duplicate at two different dilutions. The data shown here represent one of at least three independent experiments. Endotoxin activity of the LPS and its lipid A was determined at the concentrations between 10 μg·ml-1 and 10 pg·ml-1 with the Limulus amebocyte lysate (LAL) test kit  from LAL Coamatic Chromo-LAL K (Chromogenix, Haemochrom). The standard endotoxin used in this test was from Escherichia coli (O55:B5), and 10 EU·ml-1 corresponds to 1 ng·ml-1. In this assay, saturation occurs at 125 endotoxin units EU·ml-1, and the resolution limit is ≤ 0.1 EU·ml-1 (maximum value for ultra pure water from embryo-transfer, Sigma). We are indebted to G. von Busse, U. Diemer, and K. Stephan for technical assistance in the IR spectroscopic, LAL and TNFα measurements, respectively. B. Fölting is acknowledged for excellent technical assistance in the DSC experiments. This work was supported in part by grant No. 2/3021/23 of the Scientific Grant Agency of the Ministry of Education of the Slovak Republic and Slovak Academy of Sciences. Furthermore, this work has been carried out with financial support from the Commission of the European Communities, specific RTD programme "Quality of Life and Management of Living Resources", QLK-CT-2002-01001", 'Antimicrobial endotoxin neutralizing peptides to combat infectious diseases'. RT supervised cultivation and isolation procedures, GC- and MALDI-TOF-MS analyses, and wrote the chemical part of the manuscript, PG performed the DSC, JA the IR-spectroscopic measurements, KS accomplished cultivation and purification of the C. burnetii strain Priscilla cells, AH isolated the LPS and lipid A, and run GC- and MALDI-TOF-MS analyses, MHJK the synchrotron radiation X-ray diffraction measurements, and KB supervised the FRET- and biological experiments and drafted the manuscript.